Which application would you recommend for Linux to tag MP3s? Under Windows I used to use Tag&Rename and liked it a lot; it works well under Wine, but I want something that runs natively. and a lot others, try searching your distributions repository and test some of them. I mostly use mid3v2. You can install it with sudo apt-get install python-mutagen in Ubuntu or with sudo easy_install pip;sudo pip install mutagen in OS X.
Mutagen-based replacement for id3lib's id3v2. You can set the value for any ID3v2 frame by using '--' and then a frame ID. Any editing operation will cause the ID3 tag to be upgraded to ID3v2.4. id3v2 and id3tag don't support Unicode and id3tool and mp3info don't support ID3v2. I use Ex Falso. It was installed with QuodLibet music player, so I gave it a shot. I've used it with single files, batches of files... It's pretty intuitive, and best of all, works very well. I found this thread and decided to use id3tool. I was only interested in a very light-weight tool, command-line was fine. Trying to keep my system free of clutter brought on occasionally by weighty GUI-intensive tools. After doing this, I told Banshee to rescan my music library and there were no longer any files in the "Unknown" Category. Thanks to strangeronyourtrain for this tip! I've been a dedicated user of Picard for quite some time. The only cross-platform tagger that feels truly solid. Don't forget MusicBrainz's huge music database. I just discovered this little program called puddletag. It is not as wonderful as Tag & Rename, but it's close enough. 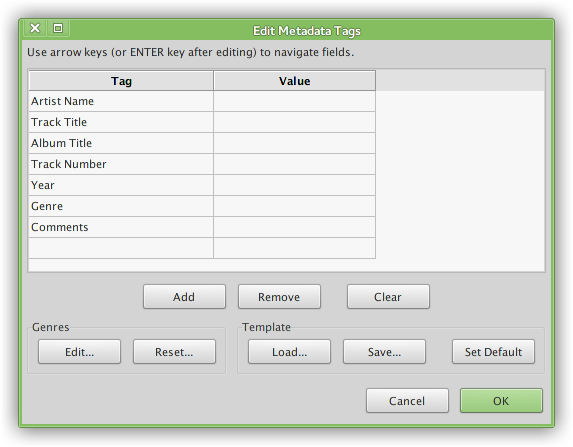 For GUI, I suggest easytag, and you can lookup more alternatives here. For the command line check out id3v2, but the alternatives are endless. I would also suggest lltag. Works on the command line, rather easy and fast. It also supports CDDB. I like TagTool and id3tool. Both are for the command line. I also find Picard useful for music files that exist in the MusicBrainz database. Note I think this uses ID3v2.4 tags (in Mp3), which are not compatible with some devices (and flippin Windows, even Win8...). Easytag however does have an options to use ID3v2.3, which should be compatible. But install it from python pip not from apt. apt currently installs 0.6 version but pip installs latest I think. Docs here: https://eyed3.readthedocs.io/en/latest/ . eyeD3 has good documentation so it's easy to start. Also it has a bunch of useful plugins - try it! Not the answer you're looking for? Browse other questions tagged command-line software-rec mp3 tagging or ask your own question. Add album-art cover to mp3/ogg file from command-line in batch mode? How can I *completely* wipe an MP3's metadata?